Gate E8 from where all the boats departing for Aegina Island. So probably is more convenient to take the bus from the Airport in order to get to the Port of Piraeus and Gate E8. From the Port of Piraeus and more specific from Gate E8 at the Port of Piraeus take one of the Boats (Flying Dolphins – 45 min. trip and Ferry Boats – 70 min. trip) that departs for the Port of Agia Marina or the Port of Aegina . Important Notice: The direct boat to Agia Marina area is operating from June to September. The name of the boat is Agia Marina. For the exact schedules please check the anes ferries and the website www.anes.gr. From the Port of Agia Marina go (on feet) to the left direction of the road (Kiriakou Galari Street 188 – Hotel Rachel Address) and just in 70 meters – walking distance 2 minutes you find our Hotel Rachel and Rachel Shops, on the left side of the road. It is more convenient to get the boat (named Agia Marina - Aegina) that departs from the Port of Piraeus and comes directly to the Port of Agia Marina as our Hotel Rachel is located just 100 meters walking distance - 2 minutes from the Port of Agia Marina. Please notice that sometimes this boat making a stop first to Souvala Port and then coming to Agia Marina in Aegina Island. The direct boat to Agia Marina is operating from June to September. For the exact schedules please check the boat company website www.anes.gr. 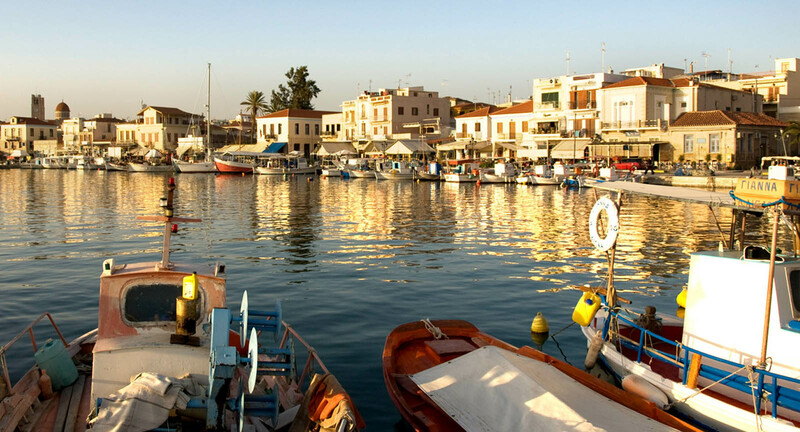 From the Port of Aegina take the Bus or Taxi in order to get to our Hotel Rachel in Agia Marina. Bus Name: Bus for Agia Marina. The cost for the bus is about 2 Euros per person one way. The cost for the Taxi is from 15 to 20 Euros. The distance from Aegina Port to Agia Marina is about 14 km and you will need about 30 minutes by bus or 15 minutes by taxi. Bus Station and Taxi Station are exactly outside the Port of Aegina from where you can get one of these means of transportation in order to get to Agia Marina and our Hotel Rachel. The bus stop in Agia Marina is in a distance of only 90 meters from our Hotel Rachel. and every about 60 minutes in winter periods / low season (regularly the periods 01/10 – 30/03). Marina (normaly 2 connections per day). You can find more information for this boat at the website www.anes.gr. for Aegina Island from the same Gate E8. (Agia Marina – Aegina boat – direct connection from Piraeus Port to Agia Marina Port) With this boat you can come directly to our Hotel. Restaurant next to this you see Rocks Restaurant and then next to this you see Thalassa Restaurant and then after these you see our Hotel Rachel &amp; Shops. Tips to get to our Hotel: Our Hotel Rachel is located in Agia Marina – 14 km. from the Port of Aegina – you can take bus or taxi to get to our Hotel from the Port of Aegina (bus for Agia Marina and taxi station are exactly outside the Port of Aegina and the bus stop terminal in Agia Marina is just 70 meters from our Hotel – walking distance). http://www.aegeanflyingdolphins.gr/ (hydrofoils – direct connection from Piraeus Port to Aegina Port - there are boat connections all Year). http://www.hellenicseaways.gr/ (Ferry Boats &amp; hydrofoils – direct connection from Piraeus Port to Aegina Port - there are boat connections all Year). km. from the Port of Aegina – you can take bus or taxi to get to our Hotel from the Port of Aegina (bus for Agia Marina and taxi station are exactly outside the Port of Aegina and the bus stop terminal in Agia Marina is just 70 meters from our Hotel – walking distance). All the boats departing to Aegina Island from the Gate E8 at the main Port of Piraeus. Normally you do not have to book ahead your boat tickets. You can get these on your arrival time at the Port of Piraeus (at Gate E8) from the various boat companies’ kiosks where they are selling the boat tickets. Agia Marina boat: Travelling only passengers and some motorbikes. Ferry boats: Travelling Passengers, cars and motorbikes. Flying Dolphins – Hydrofoils boats: Travelling only Passengers. or if you wish just call the companies directly. If you are travelling with your own car you need to take one of the ferries and not the other boats type that coming to Aegina Port as only these ferries are taking also cars.